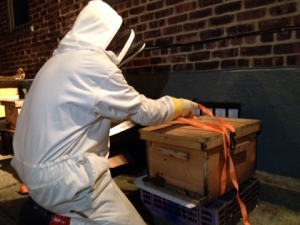 (CBS) NEW YORK - Three million bees belonging to a Queens man were confiscated by members of the New York City Beekeepers association on Wednesday night, reports CBS New York. The bees, which the station reports apparently belonged to a restaurant owner who had been a beekeeper in China, were kept in a 20 by 20 space in the as-yet unnamed man's Corona, Queens driveway. The New York City Beekeepers sealed up 45 hives at the Queens home and said that the bees will be moved within the next few days. They will die if they stay sealed in the hives. According to neighbors who had grown fed up with the constant neighborhood buzz, the Health Department had previously visited the scene. And on Tuesday, the Department of Health and Mental Hygiene reportedly cited and fined the owner. "I think most hobbyists limit themselves to one or two," Adam Johnson, of the NYC Beekeepers Association said, adding 45 hives was "beyond comprehension." While bees are legally allowed to be kept in the city, they are supposed to be registered with the Health Department. Failure to do so is punishable by a fine of $2,000 per hive, which means the owner may face a $90,000 penalty in this case.